Do You Really Need Them for Quilting? Quilting gloves have evolved over the past couple of years—getting better as quilters demanded it. If you've used them before and were under-whelmed, it's worth another try if you need some extra help gripping and controlling your quilt sandwich. Or check out my 'non-glove' alternatives to assist you in taming your patchwork! If you're going to use gloves, these are my favorites at about $8.00 a pair. My well-used pair of Machingers—not the prettiest things you've ever seen, are they?!! The gloves are thin, light weight and they breathe. 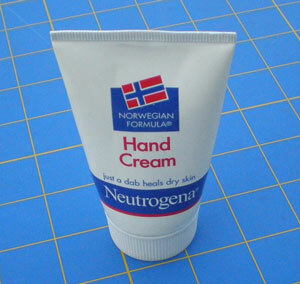 No more sweaty hands. The finger tips have a substance or covering on them that helps grab the quilt sandwich but doesn't stick to your thread tails. This is a vast improvement over previous versions of quilting gloves. As you use them, they get pretty dingy looking. I've never seen a pair stay bright white after a day of quilting. Machingers can be hand-washed in cool water with a mild soap or detergent. Air dry them afterwards. 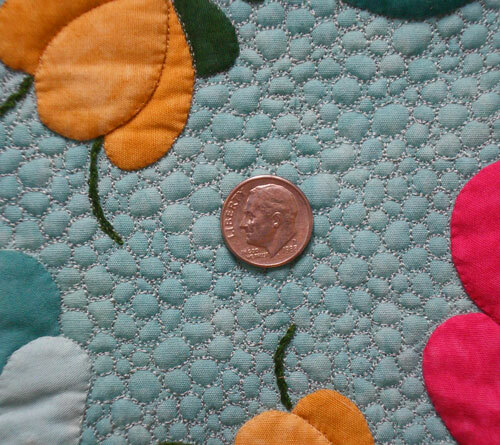 I like to use them especially when I'm doing very small tight quilting like the pebble background fill shown here. Seriously small background fill work! These gloves, in combination with the Supreme Slider, made all the difference in the world when I was doing this teensy-tiny quilting! You may be able to find them at your local quilt shop. Amazon also carries them. The very first quilting gloves I ever used were thicker and coarser than the Machingers. 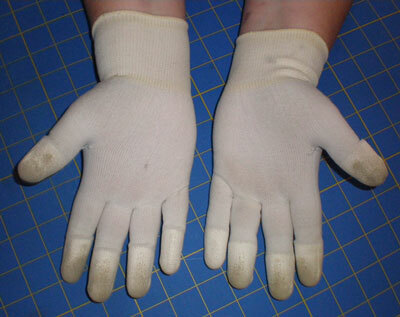 You may find these gloves in the quilt stores for up to about $8.00 a pair. Cheap garden gloves go for as little as $1.00 in the drug store, but you get what you pay for. The palms and undersides of the fingers are covered with small plastic-like dots to help grip the fabric. Yes. These ABSOLUTELY help you grip the quilt. The wicked problem is that the thread tails stick to these dots. It's annoying when you are in the middle of quilting. (Think toilet-paper-on-your-shoe annoying.) If you change threads or have lots of starts and stops, and want to use gloves, try Machingers first. The extra few dollars is worth it for a much, much, much superior product. Though a small tube will go for $4-$5, a little really does go a long way! These rings take the place of your gloves. They are placed directly on the quilt sandwich. You grasp them much like a steering wheel to maneuver your quilt under the needle. The Quilt Halo is an red, weighted, slightly tacky, PVC-coated metal ring designed by Sharon Schamber, an award winning quilter. Place it on top of your quilt sandwich. Then slide both underneath the needle of your machine. The coating on the ring helps to grip the quilt sandwich making it easier to control as you move it while quilting. The Halo is the most expensive of the alternatives to help you control the quilt, retailing for about $18-$25, though it is generally discounted a bit on Amazon. While in Paducah at the big AQS show, my mother and I watched several demonstrations with the Halo and noticed an interesting thing. We asked, "Why two? ", and were told they liked it better with two. Because of the price, if you are considering the Halo, see if you can borrow someone's and try it out for yourself first. While I have never owned this exact version of quilting rings, I did have a pair much like it early on. But they were round not square. These plastic semi-hoops are light weight with a 'grabby' plastic bottom. You hold the darker purple handles to move the quilt sandwich as you apply a bit of pressure. The opening means you don't need to try to slide the rings under your needle. The inside dimension of the smaller hoop is 5-1/2" x 5-1/2". It's 7-1/4" x 7-1/4" for the larger one. You can use both at the same time for more grip. As you've maybe guessed from my writing, I'm not particularly a fan of any of the quilting rings. I'm not a patient quilter. The rings did help me grab the fabric—without a doubt. However, you do need to STOP. Re-position the rings. Then start quilting again. As I said, I'm not a patient quilter. Personally I found having to stop when I got close to the ring to be a total pain in the you-know-where. It slowed me down and didn't help my rhythm. So why do I present them here? It's simple. You and I are different quilters. With different needs. With different amounts of patience. If you are having a terrible time trying to move the quilt sandwich, and they help you do that, then that's a good thing. You may be quite happy with the trade-off. Out of the two options here, my preference is the Quilt Halo. The weight of the ring helps to hold the quilt so you don't need to push as hard. With so many options, what's a quilter to do? My recommendation is to try the Neutrogena first, then Machingers, common garden or quilting gloves and finally the Halo in that order. ...there are several more options (in addition to the ones mentioned above) in my response to the problem when a "Quilt Sandwich Sticks to Machine". Click here to read it. Or check out the Supreme Slider. The following is a list of the products mentioned in this article.